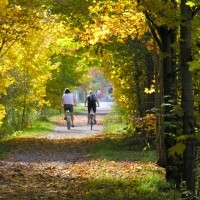 Trails in the Credit Valley Watershed cover a wide variety of geographical features, including the Oak Ridges Moraine and Niagara Escarpment, providing picturesque settings for a leisurely cycle through the area. Please use the list below to ensure that the trail you are using is designated for cycling and consider the following items of trail etiquette. Give the right-of-way to smaller and slower users. Stay right when approaching oncoming users. Stay on the trail surface. Respect the privacy of landowners bordering the trails. Leave wildlife and plants for others to enjoy. Conservation Area Trails are available during regular hours and seasons of operation. Contact: Town of Caledon (905) 584-2272. For further information contact the Town of Caledon at (905) 584-2272. 1 km the trail passes through Rattray Marsh, where platforms have been constructed to protect this sensitive area. Please note that the Rattray Marsh section may be accessed by pedestrians and wheelchairs only; bicycles are not permitted. Trail guides can be purchased from bookstores or from the Waterfront Regeneration Trust at (416) 943-8080. Visit their website at http://www.waterfronttrust.com.